Who is using the Garden Tower 2™? New and beginning gardeners with an appreciation for locally produced, nutritious, and extraordinarily fresh veggies, greens, herbs and even flowers! What is the compost column? The compost column is a 6-inch diameter perforated cylinder running down the center of the Garden Tower. The holes running down the entire length allow the composting worms to travel between the compost column and the soil column. The worms feed on the kitchen scraps and leave rich worm castings behind. As you water the soil column, the water collects vital nutrients as it passes through compost-worm castings and collects and drains into the drawer at the bottom of the unit. Garden Tower Project recommends the use of red wiggler composting worms in the compost tube. However, the addition of other types of composting worms (such as Uncle Jim’s composting worms which contain several species of composting worm) will increase nutrient transport and cycling in the tower. Night crawlers, for example, will travel throughout the soil and compost creating pathways for air and water while moving nutrients through the system. What is the Garden Tower 2™ made of? The entire Garden Tower 2 is made from 100% recyclable, food-grade plastic. Its simple, sturdy construction ensures many years of trouble-free use, even in freezing environments. The plastic used to produce the composting vertical Garden Tower is food-grade High Density Polyethylene. We selected HDPE because it is free of BPA and other plasticizers and impurities that can become bio-available over time. In time, we plan to explore the available bio-based plastics to further reduce our carbon footprint. No plastics in the Garden Tower contain BPA or phthalates. The tower is engineered to provide at least 7 years of resistance to UV radiation before the integrity of the tower’s shell is significantly reduced. In many scenarios, we expect the life of a Garden Tower to be significantly longer! I live in a hot climate. Can the red wiggler worms take the heat? From the high rim of the Grand Canyon in Arizona to Las Vegas to Apple Valley California we have hundreds of happy Garden Tower supporters in the hottest states. The only reports we’ve had of worms getting too hot were in conditions that killed high-heat vegetables as well — specifically in Nevada at sustained highs of 116-122°F in 2013. If the plants can survive the weather it has been our experience that the evaporative cooling/evapotranspiration of the plants (cooling water loss through the leaves) releases enough energy that the soil stays within tolerance to protect the worms and compost core. We have a couple early-adopter South Texas growers that are worm fanatics and also compost with other insects and they have never lost their worms in Texas heat two years and running. The thermal mass of the system prevents quick temperature changes at the core which allows the worms to move around the compost and soil for refuge. There are some additional steps you can take to protect your worms (and plants). We do suggest shade for several hours during the hottest part of the day. Also, a (sealed) frozen bottle of water placed in the compost column can provide emergency relief in extreme conditions. To learn more, please join our Garden Tower Facebook user support page. What is worm tea and what are its benefits? How do I make worm tea? When you pour water on the top of the Garden Tower 2™, some will seep through the holes of the compost column. Excess water collects nutrients and eventually settles at the bottom, where it drains away from the compost and drips into the container beneath the drain. You don’t actually make worm tea; the Garden Tower 2 makes worm tea! Getting technical – When we say “worm tea” in reference to the Garden Tower we’re generally referring to “nutrient tea” which is a mixture of both compost drainage and of water leachate which has entrained minerals and nutrients from the entire soil column through regular watering from the top of the tower. This “nutrient tea” has been analyzed following controlled use of the Garden Tower and is highly potent in nutrients and minerals required for healthy vegetable plant growth and should be returned to the top of the tower before each watering! Can you put casters/wheels directly in the feet? Although we understand it is tempting, you should never put casters directly in the feet, as this will void your warranty. Putting casters directly in the feet causes too much weight to be placed on a single point and will cause the foot to pull away from the base. This can cause the base to break and possibly fall over. Why do I need worms? Worms are an essential part of the Garden Tower design. Worms help break down the kitchen scraps quickly, allowing nutrients to be returned to the Garden Tower. If, however, you prefer to operate the Tower without worms and compost, it will still grow food effectively, provided organic plant food is added seasonally. Because of the recycling nature of the system, much less nutrient supplementation (organic soil amendment/fertilizer) is generally required. How man worms do I add to the compost column? At least 1 cup (at least two ounces) of worms should be added at least 1 week after you have a several inches of browns (clean, dried grasses/leaves, shredded paper/cardboard) and kitchen scraps in the compost column. Composting worms eat organic substances that are already decomposing (not fresh greens). A single garden tower can easily support a full pound of red wigglers, but it is not necessary to start out with so many worms! You can even buy them as “vermipods” (worm eggs). We suggest either red wigglers, red wigglers and night crawlers, or best yet, a composting worm mix containing a few popular varieties of aggressive composting worms. What should I do with the compost tea that collects in the drawer? Whenever you find “tea” or fertilizer in your container, pour it back on the soil at the top of the Garden Tower. You should not be watering the Garden Tower beyond “field capacity” (the point at which it is fully hydrated and water runs out the system) more than twice per week, or the soil and compost aeration will be limited and plant roots may remain too moist. Where do I buy red wiggler worms? You can purchase “red wiggler” worms at some nurseries, local vermi-composters and online. Check Craigslist and ask around your community because indoor composting with red worms is very popular! Nightcrawlers will also aid the system by working the full soil column and creating pathways to the compost. Common earthworms are not recommended, as they will not flourish in the Garden Tower environment. Each Garden Tower comes with a 15% off coupon for one of our favorite worm farms, Uncle Jim’s, which provides a high quality product at a reasonable price. What do I put in the compost column? Shredded brown paper or cardboard, one cup (or more) of worms plus a couple handfuls of your vegetable and fruit scraps can go into the compost column. Certain things will be difficult for the worms to eat and should be avoided. These include avocado pits, corn cobs, etc. The smaller the scraps that you use, the faster the worms will make vermicompost. DO NOT PUT ANY MEAT, DAIRY OR CITRUS PRODUCTS INTO THE COMPOST TUBE. For best performance, we recommend adding “bedding or bulking” materials along with kitchen scraps at a 3:1 ratio (3 part bedding to 1 part kitchen scraps) when feeding. This helps maintain compost air flow and drainage and prevents an excessive rate of decomposition by adjusting the nutrient balance. Popular bedding materials include torn/shredded cardboard, shredded paper, coconut coir, peat moss, and even handfuls of potting soil. Is this a system requirement? Nope, but it will aid in worm health and provide for better compost. What should I do when the compost column is full? How big should my starter plants be before I transfer them to the Garden Tower? also be started by seed. Plants that like well-drained soil do best on top. Nutrient intensive and plants that tolerate damp conditions do well on the bottom. On top: peppers, carrots, beets, leeks, onions, garlic, eggplant, turnips, tomatoes, amaranth, and more. Most other plants will grow from the side holes. Vines such as summer squash and compact melons grow nicely from the bottom holes, trailing onto the ground or trellised away to a railing, chair, stool or other piece of garden art. Balance large bushy or tall plants with compact plants to create a mosaic garden for best yield (three cabbages or broccoli cannot grow next to each other, but they can grow very nicely surrounded by lettuces or other compact veggies). Also pay attention to the rate at which various plants mature compared to others. For example, planting a cabbage which takes about 10 weeks to mature will allow for leafy green production (4 weeks) in adjacent openings until the broad-leafed cabbage overtakes the lettuces (light competition). By that time the lettuces will be near then end of their productive life. After the cabbage produces a yield you can start all over with the seeds you started for summer! You may also experiment with planting designs by planting larger plants on a diagonal in the Tower. Can I put seeds in the Garden Tower 2™ and start growing plants? Yes. There are certain plants that prefer to be direct sown, for example: carrots, beets, parsnips (root vegetables), lettuces, greens and peas. Most other vegetables are suitable to transplant.In some respects, it’s better to start seeds in flats, so that you transfer only the strongest, healthiest plants to the Garden Tower 2™. The benefit of starting indoors in flats or seedling trays is that you can start plants earlier in the season before the weather is warm enough to plant. This gives the plants more time to mature and fully develop flowers and fruit. The further north you are the more important and useful this becomes. What kind of soil mix (and how much) should I use? You will need about 8 cubic feet of potting soil. 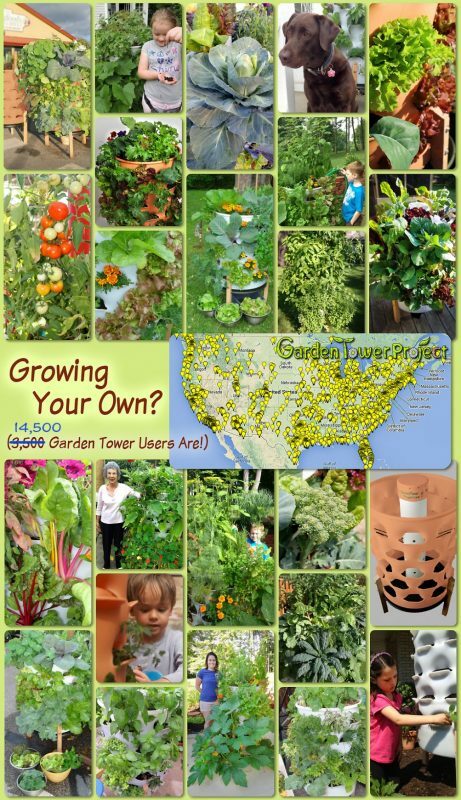 Garden Tower users typical spend $28 to $56 on a potting mix purchased locally. Like all container gardens, the Garden Tower requires potting soil (not top soil!) as a growing media. Plain garden soil will not work because it will quickly compact in a pot or container, constraining the root system and depriving it of the necessary oxygen that roots need to survive. Peat or coir based soilless potting mixes that contain no soil are popular, but also the most expensive. What is required is that you use some form of light, loose potting soil and not plain garden dirt. Organic mixes will cost substantially more than typical quality mixes and are not essential for a healthy system. To save money, you can make your own potting soil. Many recipes can be found online. The easiest (but not necessarily the best) is to mix loamy garden soil, peat moss, vermiculite, and compost or a good quality natural plant food. The soil fills the inside of the Garden Tower 2™ between the inside edge and the center compost column. Do I ever need to change the soil? Likely you will not need tochange the soil for many years. Adding some compost as a soil amendment to the pockets and top of the Garden Tower periodically is recommended. In many instances, the condition of the soil can improve with time for several reasons. However, excessive drying during the off-season should be avoided to prevent soil structure damage and keep compaction to a minimum. Lighter soils will have less compaction over time and thus lower maintenance. Plant roots and compost will contribute organic structure to the soil and worm activity will help maintain aeration and a steady rate of soil renewal. Avoiding woody-rooted perennial species (such as mints), or removing woody root masses between growing seasons is suggested soil maintenance for the Garden Tower ™. Is it possible to over-water? Not generally because of the drain at the bottom. All the water (worm tea) collected from the drain should be poured back in when you water your garden tower. However, you should not water more frequently than necessary or you can disrupt the soil and compost ecology. If your Tower is draining nutrient tea (leachate) more than once or twice per week, we suggest your allow more time between watering. That said, each soil has its own water holding capacity. Soils with more compost and garden type soils compact more and may not drain well. If your soil seems like it is staying too damp and/or not draining well (affecting the plants) then in the next season, you may want to mix in some perlite to the soil to lighten it and facilitate drainage. Conversely if you live in an arid environment and your soil is drying out to quickly and not staying moist enough, then you would add either sphagnum (peat) moss or coconut coir to improve water retention. How to I know when to water? Water wicks up the tower via evapotranspiration, so the best place to test the soil for dryness with your finger is a pocket in the lowest row. If the soil feels dry, a heavier watering is required (5-9 gallons), if the soil feels slightly moist a maintenance watering is all that is required (2-4 gallons). If the plants look droopy or dry you need to water. But generally, it depends on the weather, the types of plants you are growing, and your soil mixture. We cannot tell you when to water. Like watering your house plants or garden, you’ll get a feel for it. The drain at the bottom eliminates the possibility of over-watering. What happens to the worms over winter? There are many options for caring for your tower’s ecosystem over the winter, depending on your climate and desired level of involvement. Red wigglers can tolerate near freezing temperatures, and the tower’s 8 inches of soil helps insulate their compost tube. You can remove the compost from the tube (where most of the worms will be) and transfer it to a well-drained hole in the ground (below the frost line) covered with straw, mulch, or woody debris, and add some kitchen scraps. If you live in an area with milder winters, like the Midwest, you can cover the tower with a transparent trash bag to help insulate the tower, or move the tower closer to a building, which holds heat. If you want to grow over winter and have ample lighting indoors, transferring the tower indoors would be great, just don’t water it for a week before you move it and it will be much lighter. Does the container ever get root bound? The fine roots simply contribute organics to the soil and microbes, macro-invertebrates, and even worms will recycle them. The large roots come out with the plants and get composted (often not in the tower but in my compost pile, but a portion of them can go back in the tower). The plants that will create some issues are those with woody root systems, almost all of which are perennial. For a first time gardener, we don’t recommend perennials in the Garden Tower because some of them can create a lot of root mass which can be a challenge to deal with. However, an experienced gardener can use perennials they know they want to come back each year and plan accordingly. The only weedy perennials we’ve had that really become a problem are the woody mints. It’s important to note that the breakdown of roots often uses a lot of nutrients, so nutrient limitations are more likely to cause growth issues year to year than the actual root accumulation. Some nutrient teas can be made with inexpensive organic plant food mixes to supplement the tower should the composting not sufficient in itself — which for some plants, it simply cannot be (heavy feeders like tomatoes that pull a ton of phosphorus out of the soil). What do you do with the plants when they're done producing? At the end of a season pull the plants out with the attached soil over a tray or 5 gallon bucket. Knock the soil loose from the roots and discard or compost the root/stems if they are not too woody (most veggies are annuals are are generally not woody). Take this opportunity to mix in some finished compost and/or organic soil nutrient amendment (plant food) with the used soil. Add the soil back to the pockets with new starts or seeds to give them a good start. Repeat each season. After multiple plantings/seasons of use, it may (depending on the circumstances) be necessary to pull out all the soil and refresh it with minerals and nutrients, perhaps some more vermiculite to lighten in up, etc. However, we have towers that have been used for 3 full years and have not refreshed the soil to that extent in any of them. It’s not maintenance-free, but if everything is working well it should be very easy to keep healthy compared to conventional gardens and even typical container systems mostly devoid of soil life.